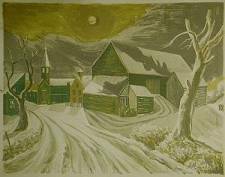 Ernest Fiene Lithograph "Winter Sun 3"
Dimensions: 16 1/8 in. x 20 5/8 in. Note: In earlier stages of his printmaking career, Fiene created small editions of first state prints (e.g. Brooklyn Bridge) that this catalogue raisonné does not recognize separately by giving them entry numbers of their own. However, the catalogue raisonné does give separate entry numbers to the independently editioned color variations created in Paris in 1965, because no record exists of the artist designating these color variant editions as differing "states" of the same work. The number in square brackets following the title has been assigned, for purposes of clarification, by us not the artist. These numbers are assigned when more than one print bearing the same title exist. ***Printer: When Fiene made prints in Paris in 1928-29, his printer was Edmond Desjobert. Although Edmond died in 1963, his workshop continued to operate under the supervision of his son, Jacques Desjobert, and Fiene made eight editions there before he died in Paris on August 10, 1965. The editions Fiene created were shipped back to family and estate representatives in New York. To view all of these editions, click here. The printing bills are very high and the work much more difficult than I had foreseen. I am doing four color prints [i.e. lithographs incorporating four different colors], that means I draw four stones for each subject. It is done in touche [tusche], like watercolor, much hit or miss and when the etching [He is referring to the etching of the lithographic stone, not to the prints themselves being etchings] is done you never know what comes out. So far I have done two editions, not too bad, and I have three going -- (unpublished letter from the Fiene family files). Paper: The edition and signed proofs are printed on wove paper with the BFK RIVES watermark, as are observed unsigned proofs. 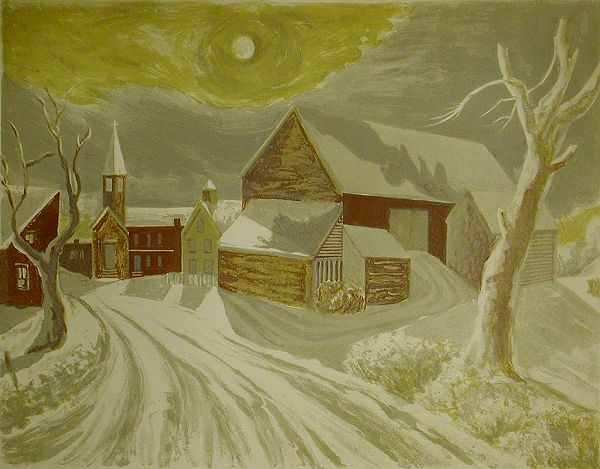 *Related Works: See the black and white 1943 lithograph titled Winter Sun . 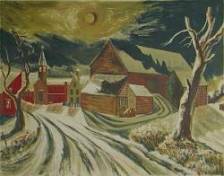 Winter Sun  and Winter Sun  are clearly versions of the 1943 lithograph Winter Sun  and all three are variants of the painting "Winter Evening," (c. 1943) collection of Abbott Laboratories (See below. ), which Fiene described as a "luminous night scene" (Fiene, Complete Guide 95). 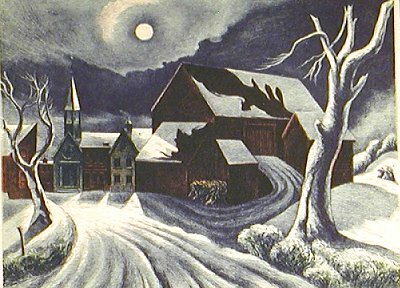 Setting: According to Fiene, the setting is "a typical Pennsylvania Dutch village," (Fiene, Complete Guide 95), a description that would therefore apply to the Winter Sun series of lithographs.